Homemade pesto and sour cream tossed with fusilli pasta and mixed with prosciutto, mozzarella, tomatoes and artichokes. 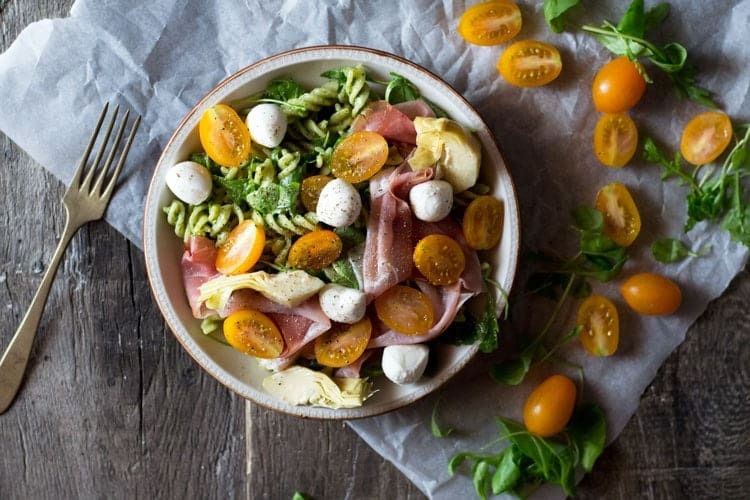 One flavour packed pesto pasta salad. I love a good pasta salad in the summer, they’re so easy to put together and the variations are endless. 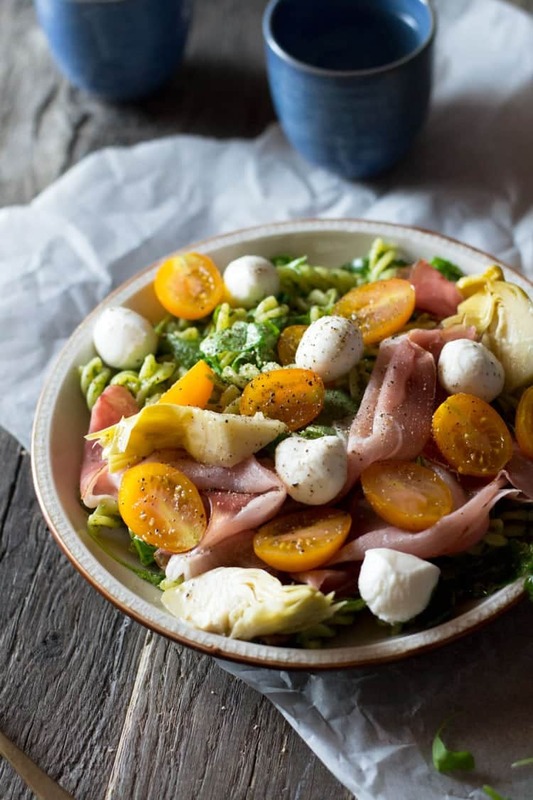 For today’s recipe, I decided on a delicious and easy pesto pasta salad with artichokes, prosciutto crudo and mozzarella balls and it’s insanely good! I don’t know about where you are but this Summer heat is unbearable at times in Italy even although I try so hard not to complain about the weather (I’m from Scotland) it’s been extra hot recently and whatever I eat I know it has to be cold. That’s why pasta salads are so great. You can even put them together in the morning and it’s ready just to pull out of the fridge at dinner time. I mean even if you made this in the evening there’s not that much cooking involved so you wouldn’t work up too much of a sweat ha! The secret to the best pesto pasta salad is making homemade pesto! Oh yes I cannot stress enough how different jarred, store bought pesto is, I mean I wouldn’t even call it pesto (can you tell I really don’t like the stuff?). Making homemade pesto is so easy and it takes all of about 5 minutes if not less. Throw fresh basil, pine nuts, garlic, parmesan and olive oil in a bowl with a little squeeze of lemon juice, salt and pepper and blitz it up into a smooth paste using a hand held blender, done! So easy and utterly delicious. For this pasta salad I also add a tablespoon of sour cream into the mix and it’s soo good. If you haven’t tried pesto and sour cream yet then you’re missing out big time. Check out my recipe for sour cream pesto dip with prosciutto dippers. Once you’ve made the pesto mix it with some cooked fusilli pasta that’s been run under cold water to cool right down. Mix some arugula through the pasta and pesto and dived it into bowls. Top with slices of good quality prosciutto (always get it cut fresh from behind the counter if you can), cherry tomatoes, mini mozzarella balls and jarred artichoke hearts. 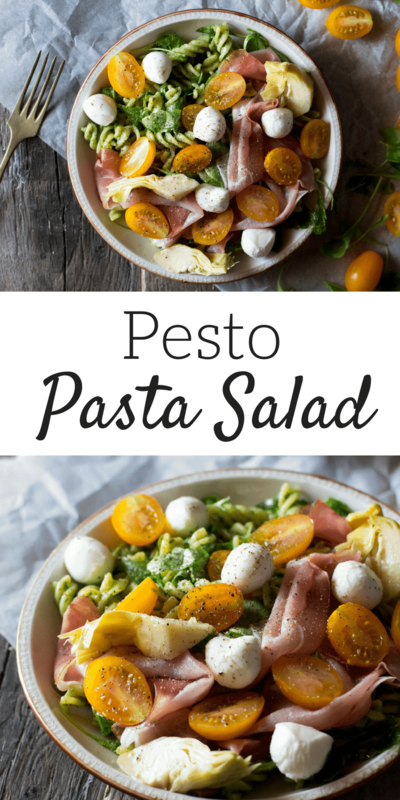 Now you’ve got your self one dee-licious pesto pasta salad for dinner. I hope you enjoyed today’s post, don’t forget to hop over to my blog Inside The Rustic Kitchen to say hi! To make the pesto put everything in a bowl except the sour cream and blitz to a smooth paste using a hand held blender. Stir in the sour cream and set aside. Bring a large pot of salted water to a boil. Cook the pasta until al dente according to packet instructions. Drain the pasta and run under cold water until the pasta is cold, pat dry with some kitchen paper to remove excess water. Add the pasta and pesto to a bowl and mix together then add the arugula. 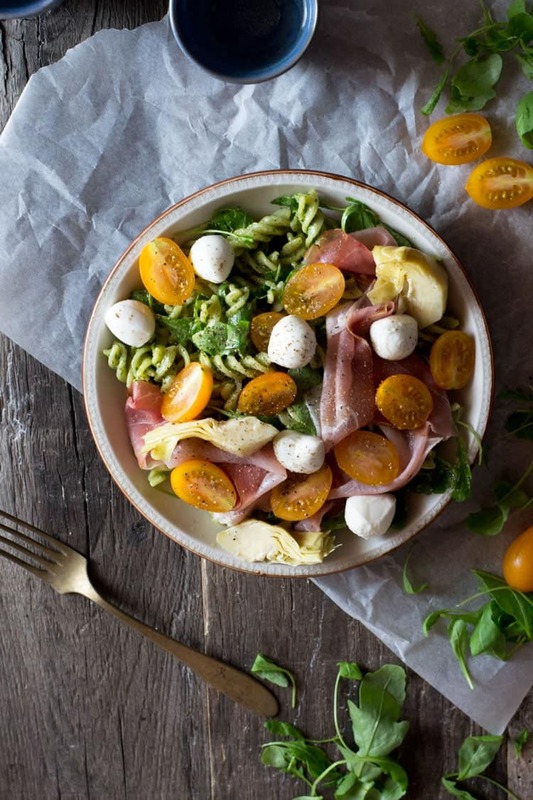 Divide the pasta between bowls and top with slices of prosciutto, cherry tomatoes, artichokes and mozzarella balls.